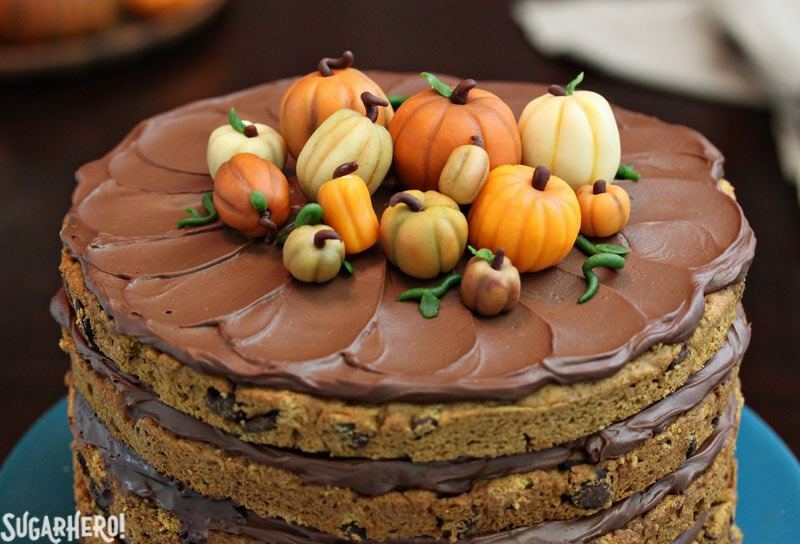 Love pumpkin and chocolate together? Then this is the cake for you! 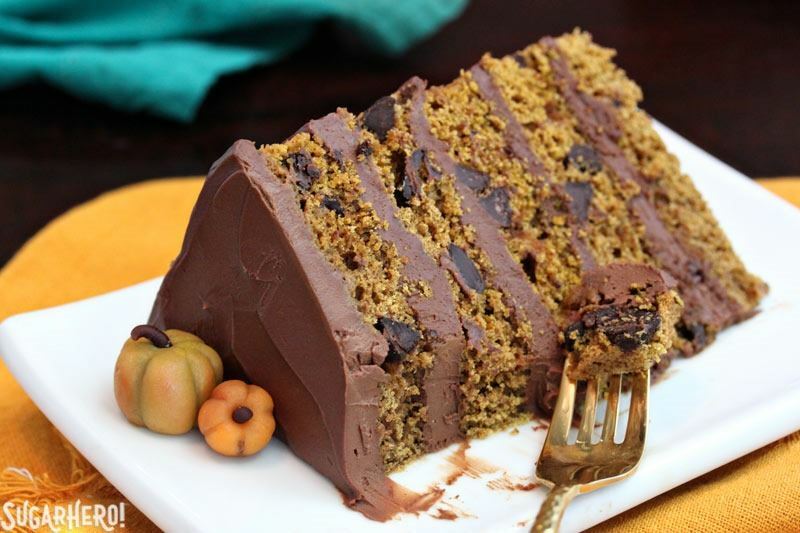 This Pumpkin Chocolate Chip Cake has five tender layers of pumpkin cake, PACKED with chocolate chips. 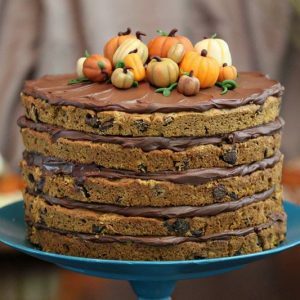 The frosting is a chocolate-sour cream frosting with a bit of almond, and the whole cake is topped with adorable marzipan pumpkins! 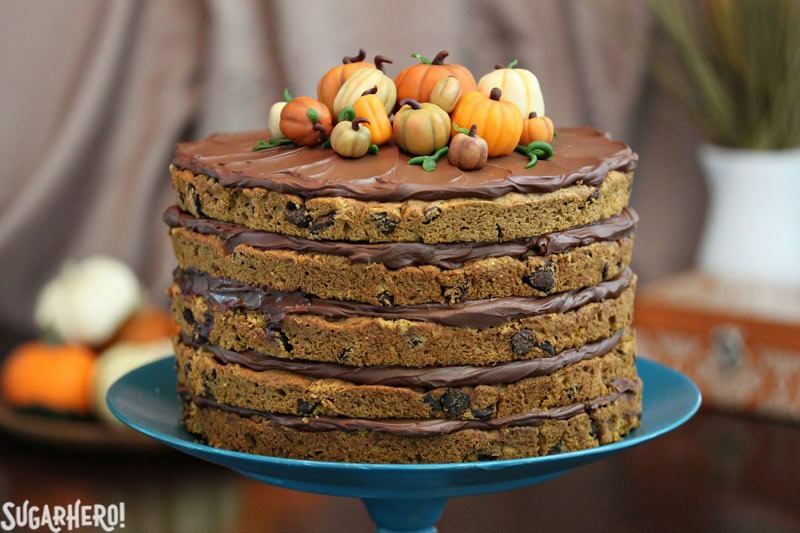 This lovely naked cake was actually originally conceived as a pumpkin chocolate chip cookie cake. I’ve done the whole cookie cake thing before (check out my Neapolitan Chocolate Chip Cookie Cake!) and it’s always a huge hit with kids and adults alike. There’s just something about giant cookies and frosting that is irresistible. And pumpkin chocolate chip cookies are ubiquitous this time of year. You can’t throw a piece of Halloween candy without hitting a pumpkin chocolate chip cookie, amirite? So I wanted to mash those two favorite things together into one deliciously luscious layered treat. The problem is that pumpkin chocolate chip cookies, at least the way I make them, are already very cakey. They’re soft, pillowy, and plush, and when they’re blown up into full-on cake size, they basically taste like cake layers. Whoops. Soooo, while this cake was made using a cookie dough recipe as the base, it does a very convincing job of tasting like a regular cake. So call it what you like—a cookie cake, a naked cake, a layer cake, or just plain delicious. We’re not picky around here. 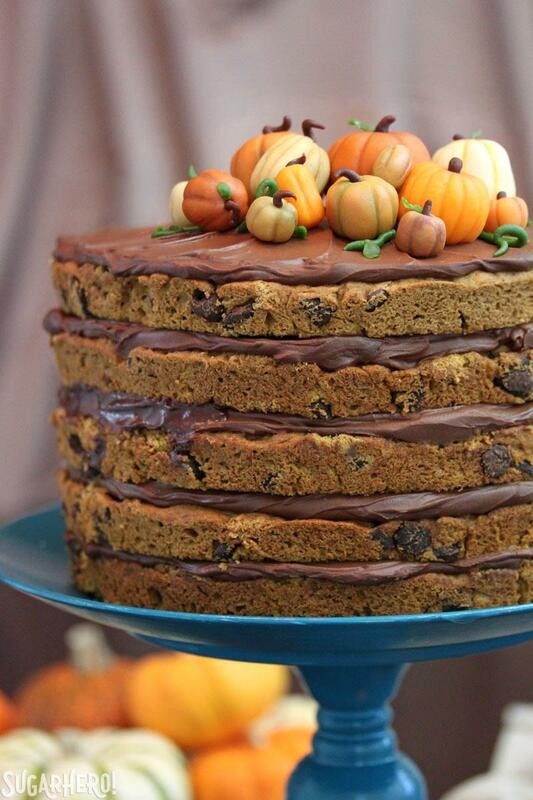 And if you have a pumpkin chocolate chip cookie (or cake!) 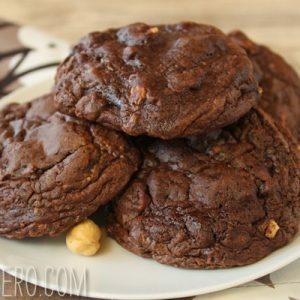 recipe that already love, you can swap that in and just use the frosting and marzipan pumpkin components. Speaking of the marzipan pumpkins, can I just include about a million beauty shots of them, already? I am so in love with how they turned out. I took my inspiration from the mini pumpkins currently gracing my kitchen table (above). I just love the different shapes, sizes, colors, and patterns of them, all jumbled up together, and I wanted my cake toppers to have the same sort of wild variety. The mini pumpkins are made with store-bought marzipan (I use Odense brand, found here), which is commonly found in the baking aisle of many large grocery stores. 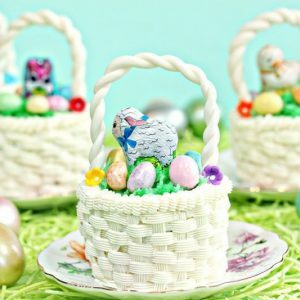 You could also use fondant, but I personally love the taste of marzipan and just think it’s a better choice for small decorations like these that might actually get eaten. I used an assortment of gel colors (like orange, yellow, and ivory) to make the different pumpkin shades, and then brushed them with different petal dust colors (primarily moss green, brown, yellow, and dark orange) to add some realism and dimension. Here’s a quick photo tutorial of how to make a pumpkin. Fortunately, pumpkins have a really basic shape—if you can roll dough in a ball, you can make them! (Aren’t you glad the giraffe isn’t the symbol of Halloween?!) Roll your marizpan into a squat circle, then press a toothpick against the sides to make the creases. I brushed the petal dust on next—if you don’t have petal dust, you can use a bit of cocoa powder to darken up the creases—that’ll work just fine. Next, use the opposite end of the paint brush to poke a hole in the top of the pumpkin. Roll some brown marzipan into a very thin rope, and stick it in the top for a stem. Easy, right? The bad news is that you’ll have to repeat it a dozen more times to make all the little pumpkins, the good news is that I found it SUPER fun and kind of a zen exercise to roll and decorate all the different pumpkin shapes and shades. Your mileage may vary on that, so just remember that it’s YOUR cake, and if you only want a few pumpkins on top, you do you! Don’t feel the need to make a whole pumpkin patch like I did. And just to give you an idea, I got all of the decorations on this cake from 1 standard 7-oz package of marzipan. Good deal! The cake layers are frosted with an easy chocolate-sour cream frosting. If you’re familiar with ganache, this is the same idea, except in place of heavy cream, I use sour cream instead! 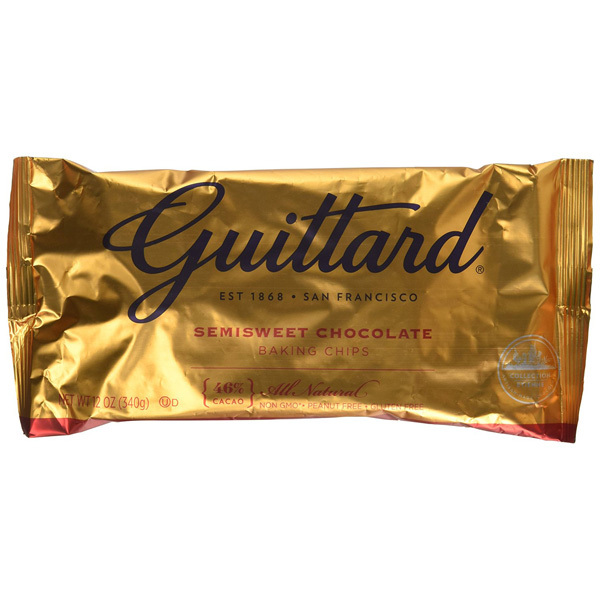 It gives the chocolate a complex, tangy flavor, and it has a gorgeous glossy texture. I also added some cinnamon and almond extract to the frosting, to tie it into the almond flavor of the marzipan. 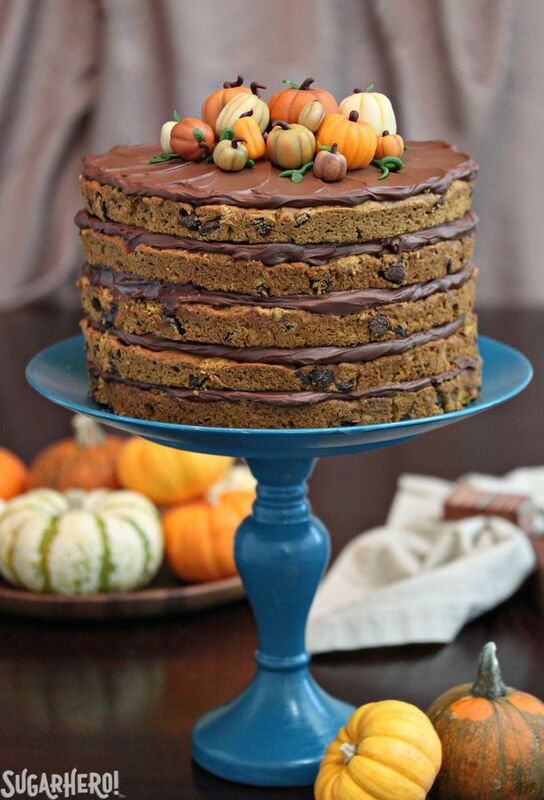 This is a gorgeous, show-stopping cake, perfect for Halloween, Thanksgiving, or any fall night. Enjoy! 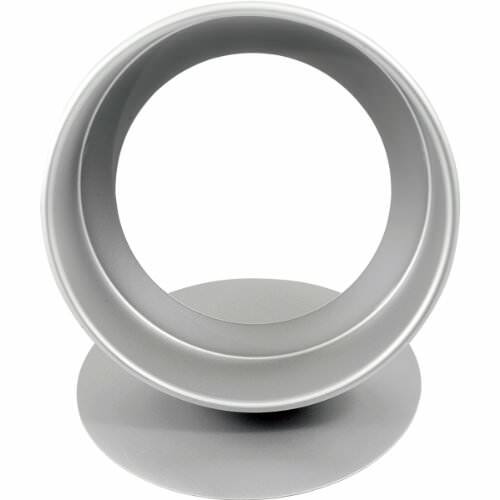 Preheat the oven to 350 F. Line 5 9-inch cake pans with parchment rounds, and spray the pans with nonstick cooking spray. In the large bowl of a stand mixer, combine the melted butter, pumpkin puree, and both sugars. Mix together on low speed with a paddle attachment until combined. Add the eggs and vanilla, and mix until well-incorporated. In a separate large bowl, whisk together all of the dry ingredients. Add the drys to the mixing bowl, and mix on low speed until just a few streaks of flour remain. 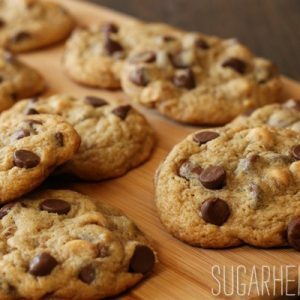 Add the chocolate chips, and stir everything together with a spatula until the chips are dispersed and there are no more dry patches. Divide the batter evenly between the 5 prepared pans. If you have a kitchen scale, each pan should get 16 oz of batter. Bake the cakes for 17-20 minutes, until a toothpick inserted into the center comes out with just a few moist crumbs attached. Let cool completely before assembling. Place the chocolate in a large microwave-safe bowl. 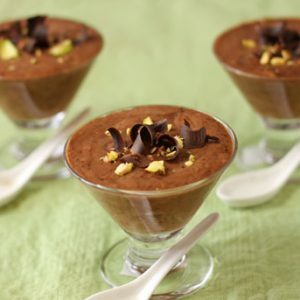 Microwave in 30-second increments, stirring after every 30 seconds, until the chocolate is melted and smooth. Add the sour cream, vanilla, cinnamon, and almond, and whisk until the frosting is smooth. It will be fairly loose at first, so let it cool at room temperature, whisking occasionally, until it as a workable frosting texture. If you make it in advance, press a layer of cling wrap directly on top of the chocolate and store at room temperature for a day, or in the refrigerator for up to a week. It will get firm as it sits, so to use it, reheat in short bursts in the microwave, stirring frequently, until it is smooth and spreadable. Divide your marzipan into an assortment of small balls—you can vary the sizes depending on how many pumpkins you want and how big you want them to be. Reserve a little bit of marzipan to make the stems and leaves. Wearing the food-safe gloves, knead a bit of gel food coloring into a ball of marzipan. If it starts to get too sticky, add a bit of powdered sugar. Roll the marzipan into a squat round shape, and press a toothpick around the sides in even intervals to create the pumpkin creases. 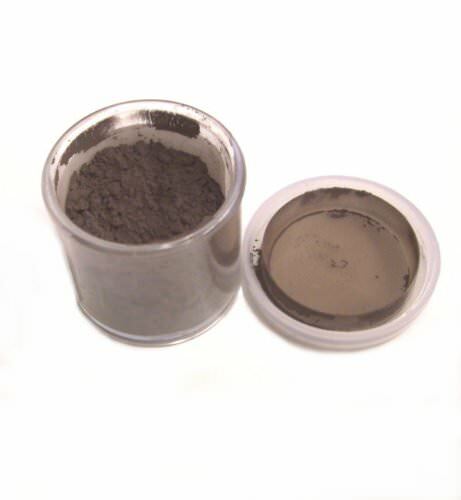 Using a dry brush, brush a bit of brown or moss green petal dust in each crease. You can also use other colors, like yellow, dark orange, or green, around the pumpkin, to give it additional realism. 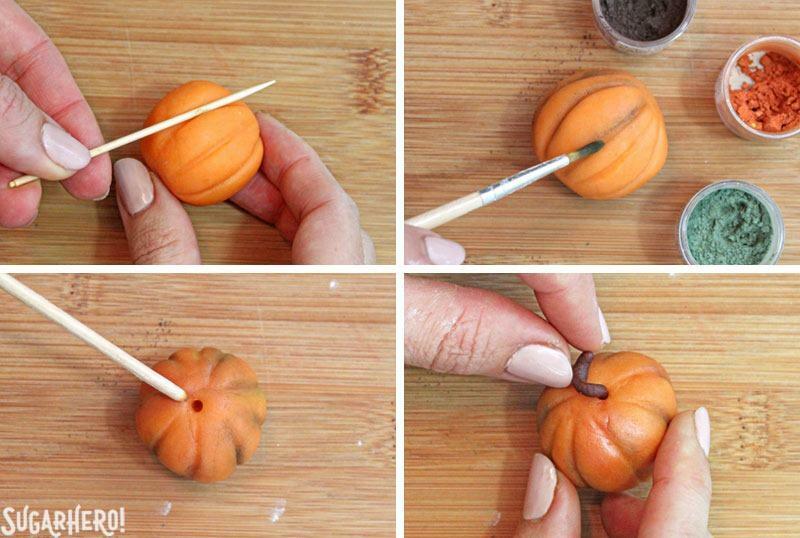 Use the back of the paintbrush to poke a hole in the top of the pumpkin. Repeat with the rest of the pumpkins, varying the sizes, colors, and shapes to make a unique assortment of pumpkins. Once all of the pumpkins are made, color some of the reserved marzipan a dark brown color, and make small stems for the pumpkins. Brush the stems with a bit of corn syrup, and insert them into the holes in the pumpkins. Color the remaining marzipan a dark moss green, and make additional vines/leaves as desired. Place a cake layer on a cake cardboard or your serving place. Place a generous dollop of frosting—about a cup and a half—on top of the cake, and spread it out to the edge. Repeat with the remaining cake and frosting. If the cake seems unstable while you’re assembling it, chill the frosting briefly so it’s thicker before assembling. You can also frost each individual layer, then stack the frosted layers on top of each other, if that helps things feel more stable. Top the cake with the marzipan pumpkins, and chill for 15-20 minutes to set the frosting. For the best taste and texture, serve this cake at room temperature. Those mini pumpkins are too cute! How could you even stand to eat them?? I’ve never worked with marzipan before–how long will the decorations last? Marzipan technically lasts for ages, but they’re nice and soft within 2-3 days, and after that they get harder (similar to how fondant gets hard the longer it’s exposed to air). If you want to make them weeks in advance you can keep them in an airtight container, and then put them on top of the cake when you’re ready to use them. Haha, love your youth slang. 🙂 Thank you Brian! I have a lot of fun playing with my food. 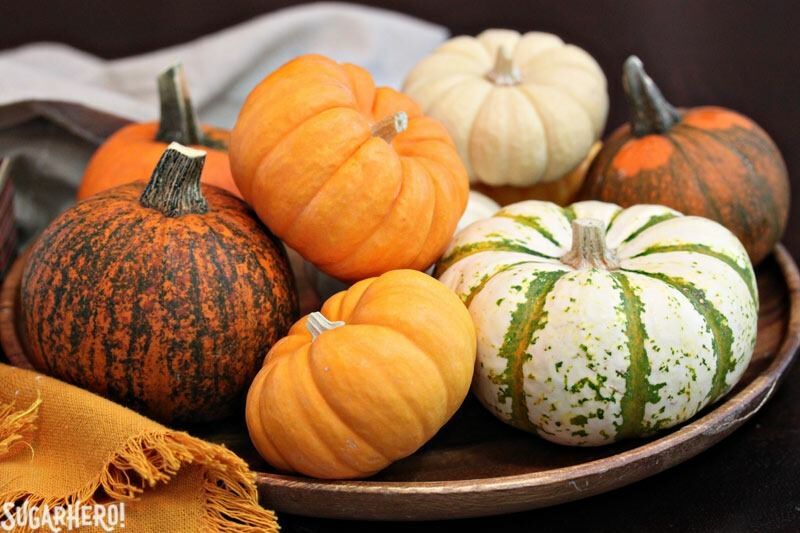 Those mini pumpkins are so cute and this is beautifully presented. Yay for pumpkin everything! Thank you Dannii! Three cheers for pumpkin season! This is so utterly adorable! The love and artwork that’s gone into those mini pumpkins – just, fantastic! Thank you, fellow Elizabeth! Sculpting the pumpkins was super fun! Thank you Jo! Making this cake was such a blast! Haha, pet pumpkins! I’m into it! I hope you’ll share pics if you give the marzipan pumpkins a try. I love how your ‘oops’ dessert is a stunner whilst for the rest of us an ‘oops’ ends up in the bin! The mini pumpkins are so cute! oh what a fine work. Its looks real pumpkins. Thank you! I was definitely inspired by the mini pumpkins I’ve been displaying this season. Oh wow Elizabeth! You have really outdone yourself with this cookie. . .err…cake. . .let’s just call it cookie cake (a good stripper name, no?). Anyhow, I just love the idea of cookies in cake form. . . slathered with delicious frosting. 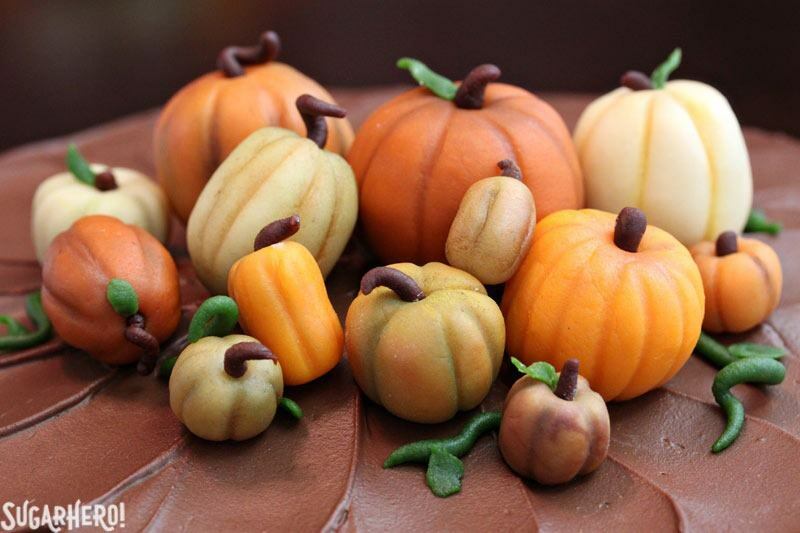 And those marzipan pumpkins. . .so, so cute. I haven’t worked with marzipan yet; however, after seeing these little cuties. . .it’s definitely making it onto my shopping list. Love them! Haha! Cookie Cake would make a very fine stripper name indeed. Thank you, Lynn! 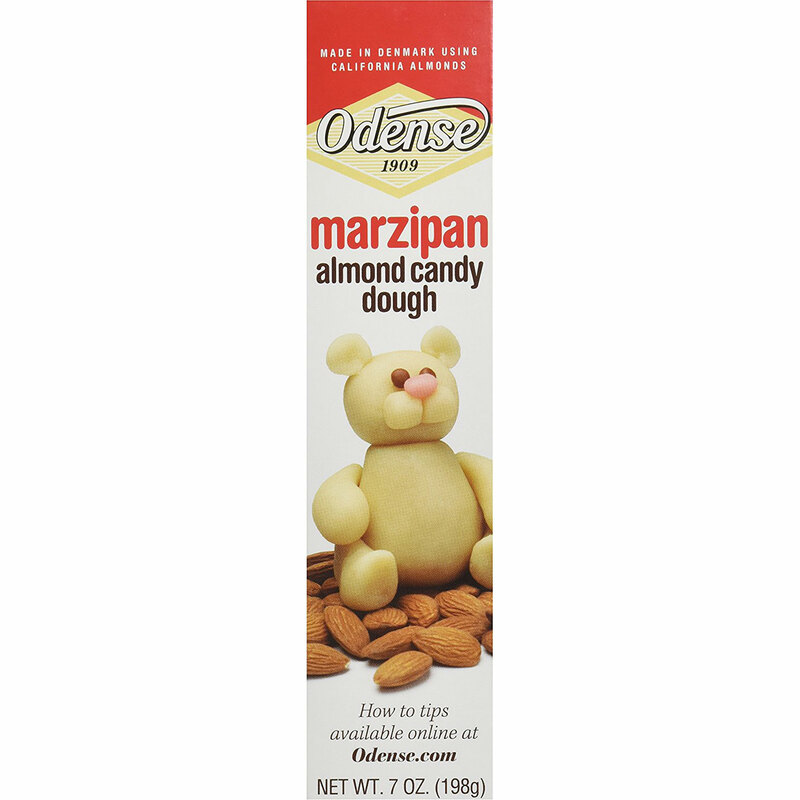 Marizpan is just as easy to work with as fondant, and it tastes about a million times better (if you like almond-flavored desserts). I can’t wait to see what you do with it! Elizabeth I LOVE this cake. I have made this cake twice now. and both times were amazing.